The potential synergism derived by bringing together artists and scientists to raise environmental awareness has been underused by conservationists. The Branching Out Project joined scientists with artists and others at a multi-aged forested area at Ellsworth Creek, a site owned by The Nature Conservancy in Washington State. These gatherings were known as “Canopy Confluences.” Participants were taught to climb trees and access canopy platforms 60 feet above the forest floor. They were encouraged to record what they perceived, felt, thought, and saw during two three-hour platform shifts each day for one week. They recorded thier experiences in whatever medium they chose, such as writing, music, drawing, or sculpture. The diversity of participants facilitated new perspectives and understanding of forest canopies. Branching Out enabled the multiple values of the natural world to be expressed through a variety of means. 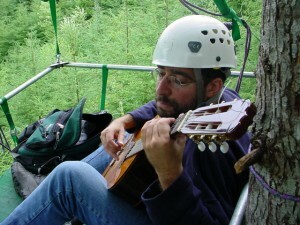 A varied group of “forest novices”, including visual artists and musicians, blind people, and Inuit were invited to participate and join with forest scientists. These “forest novice” groups provided considerably different insights and perspectives than those obtained from traditional forest-related disciplines. A striking variety of art and music was created by the diverse cadre of people who participated in the project. 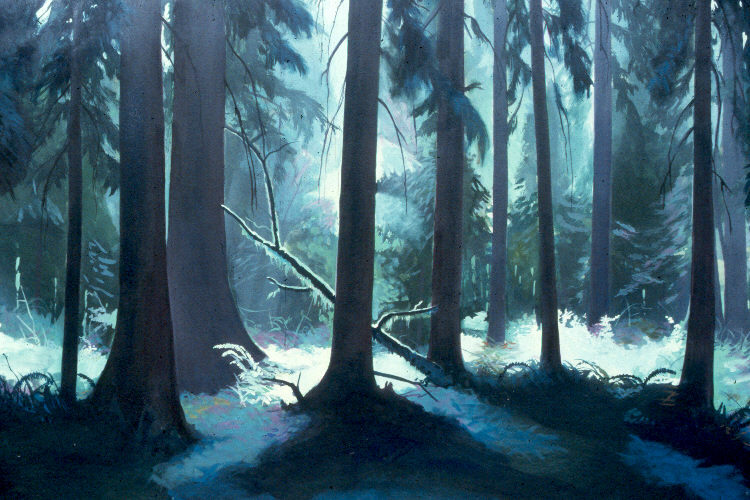 Pastel, acrylic, and charcoal images were composed as well as oboe, bamboo flute, opera and classical guitar music. All media beautifully captured the aesthetic values of the forest canopy. 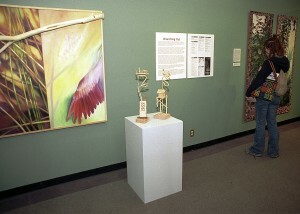 The artwork was shown in an exhibit titled “Branching Out: New Eyes in Old Growth Forests”, part of an Art and Science Chautauqua held at The Evergreen State College. Branching Out project participant Laurie Weisman documented her experience, and has graciously posted her video online.